Over-the-counter (OTC) trading desks like Circle Trade play an essential role in the crypto industry but few people understand why they’re important, how they work, and what separates one from another. 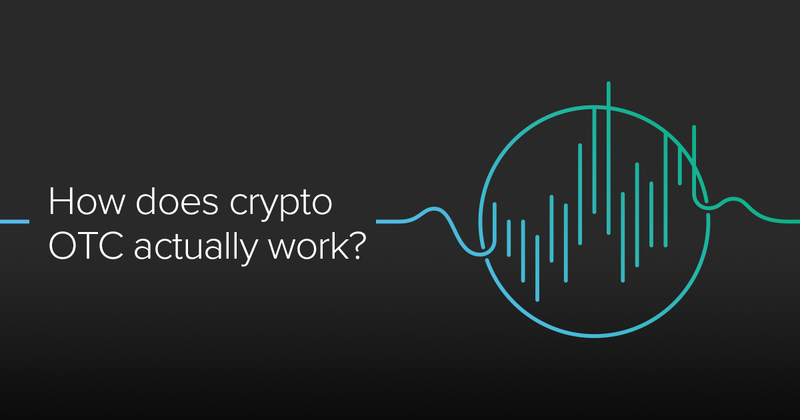 As part of our mission to provide you with key market insights, we at Circle Research put together an in-depth look at the relevance, structure and taxonomy of crypto trading desks. Similar to their counterparts in traditional finance, crypto OTC desks deal in immense volumes with seeming opacity, outside the periphery of the public eye. In this article, we’ll aim to bring clarity to how crypto OTC actually works. There are two basic ways of organizing financial markets — exchange and “over the counter”, or OTC. Exchanges such as the New York Stock Exchange or a crypto-equivalent like Poloniex essentially act as mediators between buyers and sellers. Traders post prices they are willing to sell assets for (asks) and others post prices they are willing to buy assets for (bids). When a bid and an ask overlap, the exchange facilitates the trade. All trades happen out in the open and the prices that different assets trade for are what you see scrolling across the bottom of CNBC or on a website like CoinMarketCap. In traditional markets, more US companies’ shares trade OTC (about 10,000) than on the Nasdaq and NYSE combined. Trillions of dollars in bonds, commodities, currencies, derivatives such as the infamous mortgage backed securities influential during the 2008 financial crisis, and scores of other complex financial instruments trade OTC each year. The derivative OTC markets alone account for $600+ trillion in notional value every year. In short, OTC markets are where the majority of trade within the global financial system takes place. Crypto OTC is simply the trading of crypto assets directly between two parties. A trade can be crypto-to-crypto (swapping Bitcoin with Ether for example) or fiat-to-crypto (swapping US dollars for Bitcoin and vice versa). As with all other OTC markets, trade always occurs between a dedicated trading “desk” and another individual or institution, referred to as a counterparty. In 2018, billions of dollars worth of crypto changed hands over the counter. Why do crypto OTC desks exist? Mainly, because buying or selling large amounts of crypto is difficult. For example, If you were to try to buy 500 BTC you would run into a host of issues. If you attempted to buy it all on one exchange, odds are that no one person is selling 500 BTC at any given time — you would have to buy it from multiple sellers. You’d likely be able to buy the first chunk at the going market rate, but would end up buying the last chunk at a significantly higher price — this is known as slippage. Slippage occurs when you run out of people selling at your desired price, causing you to “slip” further from the original market price. To avoid slippage, you would be better off spreading your purchase of 500 BTC around multiple exchanges, buying smaller chunks of BTC at the best price available on each exchange. Actually doing this however, would require you to be onboarded with multiple exchanges and even then you would spend a great deal of time executing each individual trade, all while getting charged a transaction fee per trade. If you went to a type of crypto OTC desk known as a principal desk, they would quote you one price and if you accept, they’ll send you 500 BTC — simple as that. Where and how they get it from is not your problem — it’s theirs. Dealing with the problem of sourcing large amounts of crypto is exactly what crypto OTC desks excel at. Through them, you can buy your 500 BTC all in one shot with no fees, and without doing any of the legwork. Principal is derived from the term, “principal risk.” When you trade with a principal desk, they use their own funds to purchase whatever asset you are buying, assuming risk in the process. This is the model employed by Circle Trade. Returning to our 500 BTC example, you would start by requesting a quote through a chat application. Next, one of the desk’s traders will respond with a price based on current market rates and conditions — let’s say, $4,000 per BTC. At this point, you can decline, counter or accept. The moment you accept via chat, the desk is obligated to deliver you 500 BTC at $4,000 a piece, per a legal agreement signed during the onboarding process. At this point, the desk taps into its existing network of major exchanges and other OTC desks and figures out the optimal way of sourcing 500 BTC. Since the desk is using its own funds to buy the 500 BTC they are assuming risk — the risk that the price of BTC will start spiking above $4,000 before they can source all 500 of it. The aim of the desk is to source the 500 BTC for an average price slightly under $4,000 per BTC in order to make a profit — the difference between the average price the desk obtains it for and the price it sells it to you for is known as a spread. Once the desk sources your 500 BTC, you’ll receive instructions on where to wire your funds ($2M in this case). The desk will not send the BTC until they receive the wire. In this sense, you risk the desk walking away with your $2M, which is why the reputation of whatever desk you’re dealing with is of critical importance. Once the desk receives the wire, they’ll send you 500 BTC and the trade is complete. There is a second type of OTC desk called an agency desk. Contrary to a principal desk, agency desks do not trade with their own funds and thus, do not assume market risk. Instead of a spread based model, agency desks charge a fee to act as a middleman to broker a deal on behalf of a counterparty. If you were to buy 500 BTC from an agency desk, you would first fund an account with them and then offer a range you are willing to buy it for. The agency desk will then go and attempt to purchase 500 BTC with your funds at an agreed upon price. In this scenario your risk is that the price of BTC spikes before your agent can complete the purchase and cannot fill your order. Many companies that offer custody as a service (storing your crypto for you), run agency desks as a value add. Since they are already holding your funds, they will also buy and sell your assets on your behalf. This contrasts to principal desks that typically will only accept fiat or crypto associated with a specific trade. Simply put, anyone who wants to quickly and easily buy or sell large amounts of crypto. This can be high net worth individuals, institutions, VC and hedge funds that invest in crypto markets. OTC desks also frequently trade with each other, when for example, one desk has a counterparty looking to buy a particular asset and another desk has a seller. With the growth of the industry and asset class, the types of counterparties OTC desks trade with has become more diverse over the years. As ICOs took off in 2017, large amount of funds were being raised in Ether and project founders commonly used OTC desks to convert Ether into fiat to pay day-to-day expenses. Miners — the people who get paid in newly minted crypto to run computers that secure networks like bitcoin — use OTC desks to convert crypto into their local fiat currencies in order to pay expenses. Similarly, an exchange that collects fees in crypto will trade OTC to convert back into fiat or increasingly, into stablecoins like USDC. Five years ago, crypto OTC desks did not exist with the structure and scope that they do today. Now there are multiple desks operating on a global scale, trading billions of dollars a year — a reflection of how much this industry has grown since the bitcoin network launched ten years ago. While the billions of dollars that crypto OTC desks handle annually pale in comparison to the trillion dollar volumes of traditional OTC counterparts, there remains tremendous room for growth. As existing crypto assets grow and as new ones are introduced, OTC desks like Circle Trade will be there behind the scenes, keeping the markets moving. Thanks to Bea O’Carroll, Nick Gustafson, Cody White & Yinfeng Shao of Circle Trade for helping inform this article. If you want to learn more about crypto OTC desks, check out this Flippening podcast from Nomics Crypto, that also helped inform this article. For more research and insights, subscribe to Circle Research.